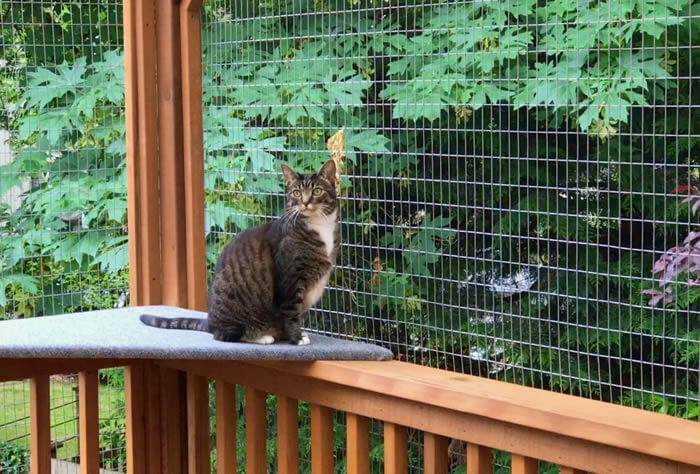 When DIYing your catio, it’s important to think through the materials you use to keep your cats safely inside—and other critters out (no dangerous wildlife, please!) 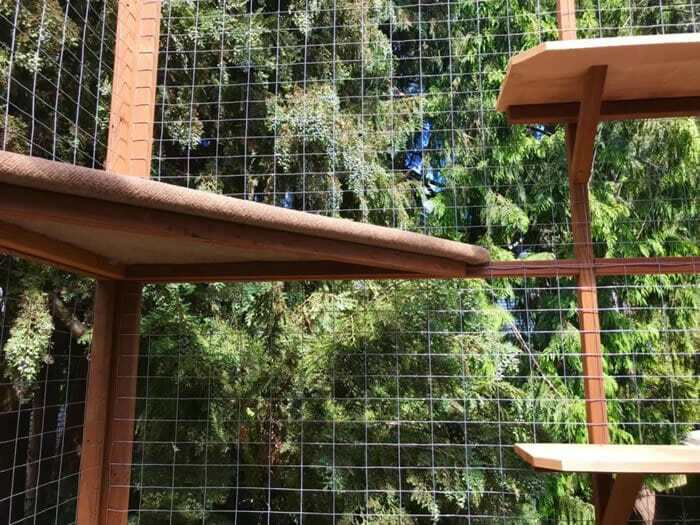 Chances are your kitty is going to explore the catio thoroughly, including trying to paw at the enclosing mesh and maybe having a nibble here and there. So it’s important to think through the type of enclosure mesh you use for your catio. Not all material is created equal. While standard chicken wire and enclosed porch screening are readily available, chicken wire isn’t very strong and may leave jagged edges when cut (increasing risk of injury for both your cat and you) and it may rust. Similarly, porch screening isn’t the best choice either as it’s easy for persistent cats and wildlife to get through. 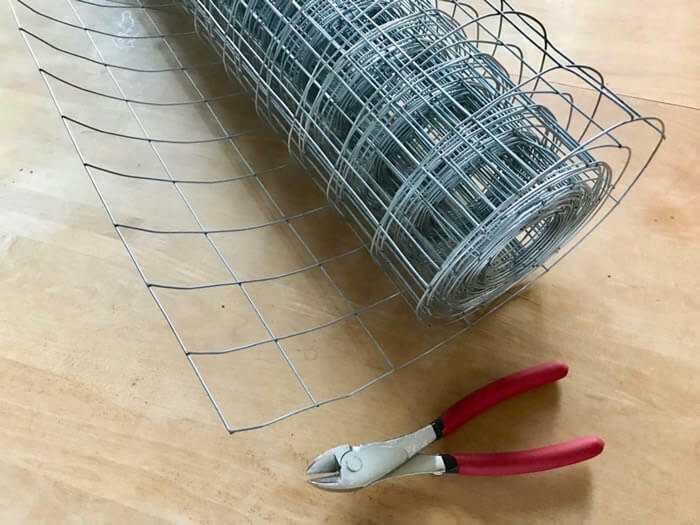 That’s why I’m very specific about the material we recommend for our DIY catios, including our recommendation of using 16-gauge, 2” x 3” grid-opening fencing wire. Readily available: Standard 16-gauge fencing wire comes with a 2” x 3” grid opening and is readily available at most home improvement stores. The wire comes in varying heights and is quite easy to install on one of our catios. The 2×3 grid allows a more expansive view of nature while still providing safety. 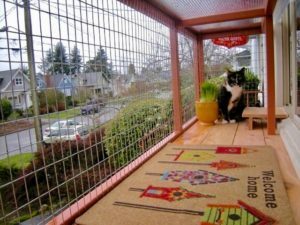 Smaller grid openings are also available if that is more suitable to your catio location and personal preference. Easy to work with: This 16-gauge fencing wire, so sturdy yet pliable, is user-friendly and can be cut with flush-cut pliers. It’s rather easy to roll out, measure, cut, and staple to the wood frame. If you use a smaller wire grid, keep in mind the amount of cutting required when planning your project. Edges are smooth: When the fencing wire is cut flush to the welded grid line, it leaves a smooth edge that’s easy to secure to the catio frame. No matter what size of wire grid you use, avoid anything that leaves sharp edges that can catch your cat’s paws or skin. Various wire gauges are available. The lower the gauge number, the stronger the wire. I recommend the durability of 16-gauge fencing wire (chicken wire is typically 19-22 gauge). Remember, while window-screen mesh has tiny openings, it isn’t sturdy enough to withstand your cat’s claws. When shopping for your enclosure wire, consider the strength of the material. If you can damage it with your paws, you can bet your cat can too! Look for galvanized (rust-free) fencing wire, depending on climates. Durability is key. You want your catio to last so it’s important to find a material that is suitable for your climate. Especially avoid vinyl-coated wire because it breaks down and splits over time (and kitty may help it along the way by chewing on it!) Instead, make sure your fencing wire is galvanized to provide long-lasting rust protection. Getting the right materials to construct your catio is just as important as having a solid blueprint for the structure. 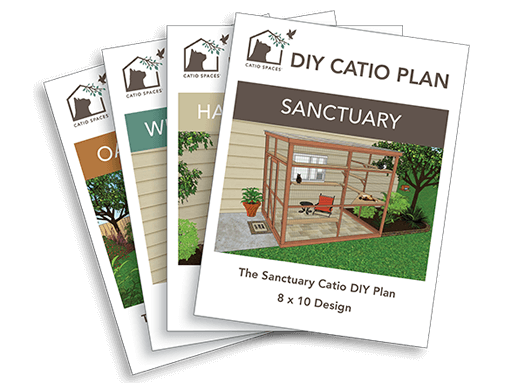 Our downloadable DIY plans provide catios of different shapes and sizes to fit a variety of outdoor locations and cat family sizes. Plans come with everything you need to take the guesswork out of building a safe, sturdy, and long lasting catio. 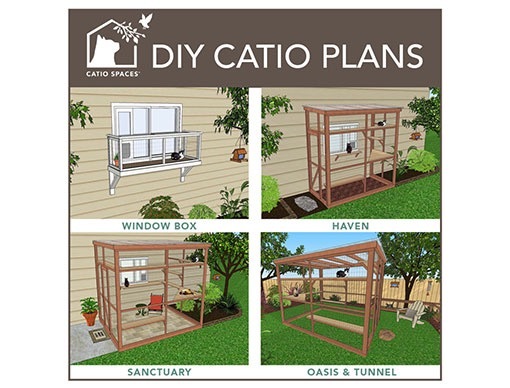 Whether you build a catio yourself or hire a carpenter to build a plan for you, your cat will enjoy the stimulation of the outdoors while you enjoy peace of mind knowing your cat it always safe. Life is good in a catio!